One year ago Vancouver-based Northern Empire (TSXV:NM) paid Imperial Metals Corporation US$10 million to acquire a 100% interest in the Sterling Gold Property. Due to Imperial Metals coping with Mount Polley tailings spill and ramping up Red Chris Mine, the non-core project didn't receive much attention over nearly two decades of ownership by the BC copper company. Work has now begun in earnest at Sterling. Northern Empire has a $12 million budget for 2018 and plans to drill 15,000 metres. Management includes executive chairman Douglas Hurst. He was a founding executive of International Royalty Corporation, which was purchased by Royal Gold for $700 million. Northern Empire director is John Robins, founder of Kaminak Gold which was purchased for $520 million by Goldcorp. The major highlight of the Northern Empire project is that the mine is already permitted to restart production. There have been numerous legacy mines on the site over the years. 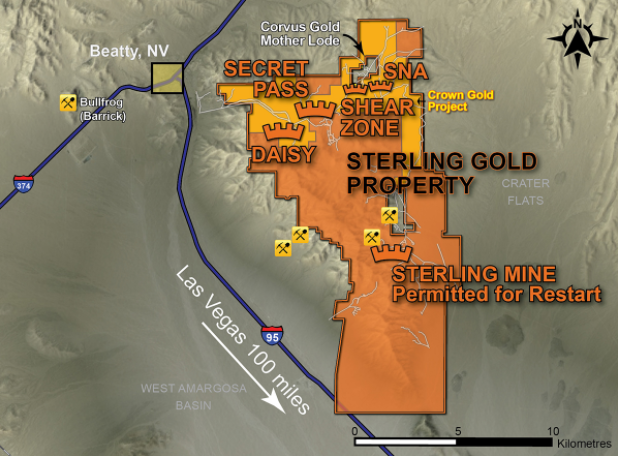 Hurst says the company is putting special attention onto the Crown Block deposits, which hosts four primary targets: the Daisy deposit, the Secret Pass deposit, the SNA deposit and the Shear Zone target. The Northern Empire's license claims surround Corvus Gold's Mother Lode project. In an interview with MINING.com’s Michael McCrae, Northern Empire’s President and CEO, Michael G. Allen, noted that project logistics are good. Sterling is located right alongside Highway 95 in Nevada. Getting there requires a two-hour drive heading north from Las Vegas. Northern Empire paid for MINING.com's visit to the site. Some photography by Richard Quarisa.